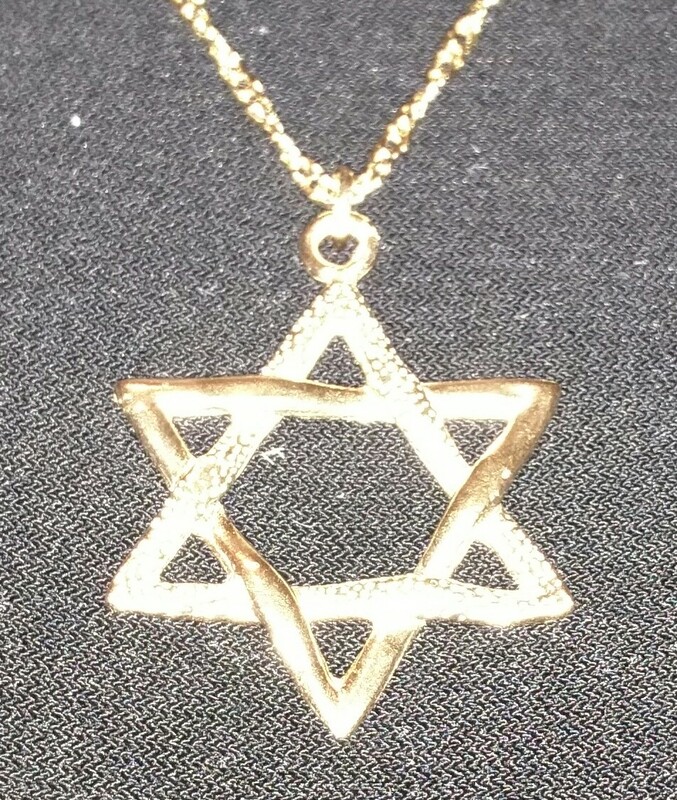 Many years ago, my husband bought me a beautiful gold Jewish star. I wore it for a long time and then the chain broke. When I was asked to speak at a conference in Stuttgart, Germany and decided to accept the invitation and opportunity to meet and present colleagues from around the world, I asked my husband to get me a new chain. I wanted, I needed, that piece of home to come with me. Procrastination and a busy life left that detail until the night before I left. In the end, as a birthday present, Lazer bought me a new star and a new chain. I put it on in the store, and haven’t taken it off. “You’ll wear it inside, right?” asked one daughter of mine. She is worried. Germany is as Poland was in her eyes – a place of dark and death. I have shared that with her and so I understood her fear and no, I had no intention of wearing it inside. I am a Jew. I am an Israeli. I am proud of both and will hide neither. She was frazzled after a 12 hour day, managing to make announcements and process a plane full of people in 15 minutes alone because Lufthansa is on strike and the overflow has effected many other airlines. I know all this not because she took the time to explain – she was simply rude. But I met a German couple and as we began to speak, I felt the first instance of concern. I didn’t come to Germany to like the people or the country. I can be honest enough with myself to say that I came for professional and personal reasons. The professional reasons are easy to explain – this is a fantastic opportunity for growth for myself, my company and, I’m hoping, perhaps in some way, the Israeli technical writing industry. To my right Michael and to my left Gabriel, in front of me Uriel and behind me Raphael, and over my head God’s presence. And if coming with all this were not enough, my great grandmother is with me, and her two daughters. My mother-in-law is with me and almost 300 relatives murdered by the Nazis on my father’s side, and my husband’s grandparents – all of them, and so many more. It’s crowded in my head, I’m sure you can imagine. So my Jewish star announces what I don’t have to. “Where are you from?” the woman asks me and so we begin a conversation. “The Germans are responsible,” she says as she thanks me for coming to Germany. I feel dishonest. I didn’t come here to like the Germans. “It’s painful,” I told her honestly and she thanks me again. They offered to help me get to my hotel but I asked them to just help explain to me where it is. I see one hotel in the distance but not the one I need. The man who had handed me a business card on the plane so that we could remain in touch beyond my short visit here went to a taxi driver to ask directions. He came back and pointed to the hotel and explained that mine was just beyond it. Truly a 5-10 minute walk as promised by the convention coordinators. Ironic…I’m in Germany. Happy is the farthest thing from my mind. Before I could say anything other than smile at the elderly man, another answered, “shalom aleichem” – peace to you. “How do you know all this Hebrew?” I asked them as we prepared to get off the plane. It seemed that they liked my being impressed. They were all older than me by a good 10 years, probably closer to 15. The woman who sat next to me for the short flight didn’t speak much English but she was very friendly…and no, I never asked her the thought that comes to mind when I see an elderly person – she was old enough. She was alive then, even if she was only a small child. She didn’t do anything…she didn’t harm Jewish neighbors…and I didn’t ask about her father, her grandfather, her uncles and neighbors. I didn’t ask because it is an unspoken rule. We look forward and smile and try to heal. But I have a gaping hole inside. “The Germans killed them,” said the kind woman earlier. I had told her about my father’s family – that my grandmother was lucky. They were from the Ukraine but had left before the war because her father couldn’t take the antisemitism and after his daughter (my grandmother) survived a pogrom by hiding in the back of a synagogue, he moved his family to America. All those that remained, as many as 300, died there, or so we believe. I told her of my grandfather being sent to America by his mother, how he worked to earn money to bring her but he ran out of time. “Yes,” I said – never even getting to tell her about my mother-in-law, who was put in a gas chamber and then pulled out at the last minute because the Nazis needed more women for a work detail. Germany, the people, is not what I expected, in some ways. In others, it is. My natural instinct is to joke around. When I got to the hotel, the night clerk was in a discussion with a guest who was complaining that although the hotel WiFi worked, he was unable to access his companies VPN (virtual private network). The clerk correctly explained that this was beyond the hotel’s problem; the man insisted. When it came my turn, I joked about how I only needed Internet, not access to my VPN and the clerk, with no understanding that I was making a joke, began to explain again that the hotel is not responsible for this. “A joke,” I said. “It was a joke.” I don’t think he got it. A short while later, he called me again from the desk and invited me for a free drink – the hotel is offering in honor of my birthday. I assume this invitation (which I won’t accept…because I don’t drink and because I keep kosher so even if I did drink, I wouldn’t know what I could have here and mostly because I don’t share “a drink” with anyone but my husband of 32 years…who doesn’t drink either). So Germany the people – polite, wanting my acceptance? I’m not sure what the right word is – friendly, open to reaching out and perhaps afraid, as a German man told me many months ago in India, afraid of confrontation. Afraid that I’ll respond to their overtures with an outpouring of the agony that is inside of me. It would be so easy to open up and let it pour out. I walk in the streets and hate them…no, not the people, the ground. I see the buildings, the clean sidewalks and my stomach rebels. They DIED here. You MURDERED them. You stole their lives, dehumanized them, humiliated and shamed them, beat them, burned them, gassed them. You gassed them to death, for God’s sake, how do you want me to feel? I accept that, I respect that. I guess in the coming days I’ll meet more Germans and we’ll see if the few I met are typical of all or not. For now, I am a Jew in Germany, in a place I never thought I’d be, struggling to accept that I have to see, to experience and find a balance between a heart filled with pain and a mind that knows there is no one who can relieve or answer what was done in this place to my family and my people. Previous Theatre of the Palestine solidarity movement. Next OzTorah: Ask the Rabbi – Naming Rights. Wonderful evocative recounting of your feelings in Germany. I can very much identify with your mixed emotions. You very much echo my own feelings when I went with my siblings and husband on a roots trip to Germany last May. My family on both sides is from Germany back to at least the 17th century (we are true-blue yekkes). I went with very mixed feeligns, determined to NOT enjoy the trip or like the people. But I couldn’t help myself. The trip was very intense and very emotional but more than that, I found that I did like the country and the people. The land is very beautiful and the people, at least those that we met, were very sincere, very contrite, and very determined to do the right thing by the Jewish people. In fact Germany, davka Germany more than any other country that participated in the Shoah, has done the most to confront its terrible past and try to atone and make up for it. I include in this list my original homeland of England (I made aliya nearly 40 years ago) which closed the gates of Palestine precisely at the time that the Jews needed it the most. You might be interested in my own posts about my roots trip which you can read on my blog here and here (there are several more posts too).